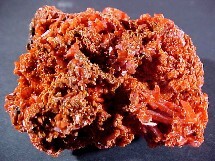 Sparkling, "rustic"-red crocoite crystals over matrix. A very nice miniature. 2" x 2" x 1-1/4" thick. 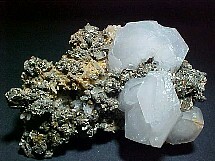 Calcite crystals on pyrite, chalcopyrite and quartz. A little variety to make an attractive miniature. 1-1/2" across. 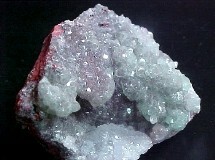 A very nice combination of sparkling crystals on matrix. 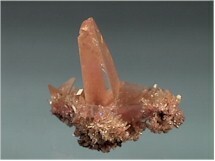 This miniature come from the San Antonio Mine, Santa Eulalia. 2" x 1-3/4". 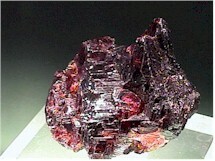 Garnet (Spessartine): Minas Gerais, Brazil. This spessartine is completely crystallized, a bright backlight allows the lovely deep red color to show through the crystal. Growth lines front and back. 3-3/4cm (1-1/2") across. From the Shan Hua Pu Mine. This wanted to be a twin but just didn't make it. There is a small twin to the left. 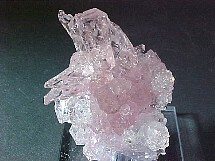 The main crystal has a ding at the termination.3 x 3 cm. Rose Quartz! : Galileia, M.G., Brazil. This beauty is pink all through. The photo really does no justice to it's true color. It is just a magnificent miniature from the Pitorra Mine. 1-1/2" tall x 1" across..